Publishing company Dow Jones is happy to spread the news about the successful 4.1 MW solar project at its South Brunswick, New Jersey, campus—the largest carport-mounted solar project at a single commercial site in the U.S.
With newspapers such as the Wall Street Journal and Barron's in its portfolio, Dow Jones is used to writing about and dis-seminating financial information worldwide. When the News Corporation owned company began considering a solar project for its South Brunswick, New Jersey, campus back in 2008, economics definitely played into the conversation. "The big issue for us was convincing ourselves it would work," says Howard Hoffman, Dow Jones vice president of corporate affairs. "But the PSE&G solar loan program made the financing of this project attractive for us. PSE&G was the key to our decision to go ahead with this." The Public Service Electric and Gas Co (PSE&G) is New Jersey's oldest and largest publicly owned utility. "And SunPower had an effective parking lot solution that made this a very viable proposal for us," Hoffman added. kilowatts of roof-mount panels on a parking garage. At the time it was dedicated in June, it was the largest carport-mounted solar project at a single commercial site in the United States. On a sunny day, the project is expected to meet half of Dow Jones' peak energy needs and save the company $800,000 annually in electricity costs. It is also expected to have a three-year payback. "We spent a lot of time reassuring all of the people involved that the numbers were valid," Hoffman says of the payback. "It seems hard to believe that it has a three-year payback." Dow Jones owns the project, and San Jose, California-based SunPower built it and maintains it from SunPower's regional office in Trenton, N.J. The South Brunswick campus is Dow Jones' largest and houses several different operations, including data management, human resources, and news gathering and reporting. 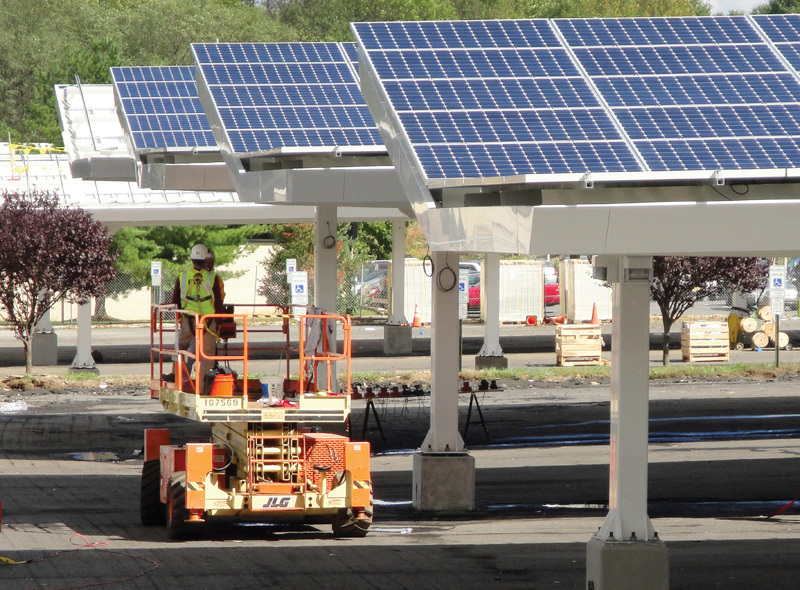 The PSE&G solar loan program to which Hoffman referred typically involves loaning 40 percent to 60 percent of the cost of a project, says Fran Sullivan, spokesman for the Newark, N.J.-based utility. The borrower is able to pay back the loan using solar renewable energy credits, or SRECs, generated by the project. Because SREC prices fluctuate with the market, PSE&G guarantees a floor value for the life of the loan. "It provides the capital that a lot of individuals and companies need to finance the system," Sullivan says. "The thing that makes it unique is it provides a ready source of capital and takes a lot of the financing risk out by putting a floor on the SRECs." Once the loan is paid off and its original term has expired, subsequently generated SRECs belong to the project's owner. Earlier proposals submitted to Dow Jones involved installing roof-mount panels on five of the campus buildings, Hoffman says. Unfortunately, he says, the rooftops were too old or had too many protrusions to make it work. In 2010, SunPower answered a request for proposals that featured installing about 230,000 square feet of covered carports on which 3.5 MW of solar panels were to be mounted. The proposal also involved installing an additional 622 kilowatts of roof-mount PV panels atop a parking garage. Altogether the 4.1 MW project will meet about 15 percent of Dow Jones' electricity needs on the South Brunswick campus and maximize the use of the parking area. "We thought about covering the grass but decided in the end that the green is important too, and decided not to extend the installation beyond the parking area and the parking garage," Hoffman says. Engineering studies showed where the carports should be situated to maximize generation. Areas with too much slope or shading were ruled out, Hoffman says. Ground was broken in June 2010, and construction began about a month later. The South Brunswick campus operates 24/7 and is home to 2,000 employees, which could have created challenges during carport installation. But problems were avoided through constant communication between representatives from Dow Jones, the different contractors, and employees, says Scott Moss, president of Moss & Associates of Fort Lauderdale, Florida, who worked with SunPower and oversaw day-to-day operations. "Communication is huge," Moss says. "If people feel they're part of the project, they usually aren't negative about the project." Signs warned commuters of pending parking lot closures, and security officers also helped ensure the safety of both Dow Jones employees and project workers. In fact, Moss says, his firm has built much more difficult projects in much tighter confines than the Dow Jones campus. "This was an easier job than a high-rise condo or high-rise office in a downtown area," Moss says. "It's something we're used to doing. "Trucks are sited a mile away. You don't have more than one truck on site. As you are taking material off, you never store it on site, so you don't have to take up a lot of space." Throughout construction, at least 2,000 parking spaces had to be kept available for employees. To achieve this, the canopies were erected in phases, and parking lot closures were rotated. Hoffman says he expected to hear complaints from Dow Jones employees, especially when a series of snow storms hit the area. But he was pleasantly surprised by the mostly positive reaction. "I think employees understood this sacrifice was worth it for the company and for the employees," he says. Solaire Generation of New York, N.Y.
"SunPower knew which one was the most attractive and which one performed the best," Moss says. "It was the best of form and function, because there are a lot of different carports out there that don't look nearly as slick and high class. These are the Mercedes, as are SunPower's panels." Laurence Mackler, CEO of Solaire Generation, took Moss' comparison one step further and says the carports are also built with the same safety philosophy as Mercedes cars. The carport supports, for example, are encased in a band of reinforced concrete two feet high to protect them from impacts from fully loaded cars. The conduits are also encased in concrete to protect them from corrosion due to road salt and car emissions. All of the metal structure is made from hot-rolled steel that resists rust rather than light gauge steel. The carports are what Mackler describes as "PV component agnostic," meaning they will accept nearly any manufacturer's panel ranging from thin film to mono- and polycrystalline. In this case, about 11,000 Sun-Power high-efficiency E 19/315mo-nocrystalline panels were mounted on the carports, says SunPower project development manager Michael Peters. 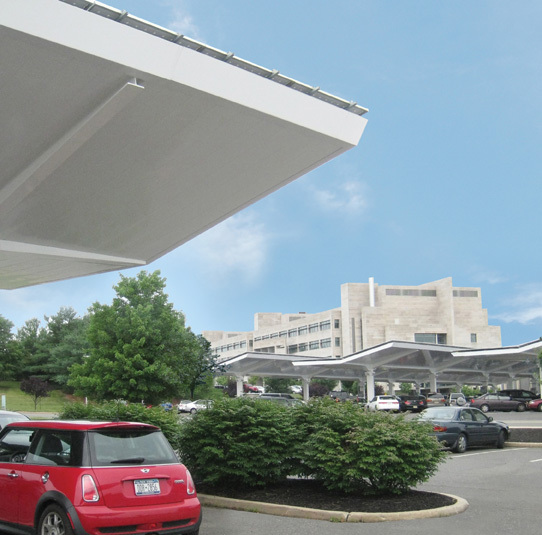 The Premium carport canopy used on the project features Solaire Generation's patented dual-incline design. It is engineered to meet wind as well as snow loading. Underground, spread footing of poured concrete anchored the carports. Solaire Generation designed, fabricated, and engineered the carports, Mackler says. Altogether, the Dow Jones project involved 25 rows of canopies, each with an average length of 200 feet. No parking spaces were lost to the canopies because the supports are only 18 inches wide. "If you were to take the canopies and put them end to end, you'd have over a mile of solar canopies," Mackler says. Atop the parking garage were installed SunPower T5 Solar Roof Tiles—a non-penetrating rooftop product that combines a high-efficiency solar panel, frame, and mounting system into a pre-engineered unit. The T5 is tilted at a five degree angle, which nearly doubles energy generation per square foot compared to systems that are mounted flat. At the same time, it features an aerodynamic, self-ballasted design that resists high winds and water runoff, Peters says. Satcon inverters convert the DC current into AC. Because Dow Jones participated in the PSE&G loan program, the PV project must be grid-connected. With the construction industry being down and New Jersey a leader in solar projects, Moss says finding workers who had experience in solar installation was not a problem. Because of the way the carports were fabricated, they were essentially erected in assembly-line fashion. As the workers became more familiar with the process, they also became more efficient, he says. Much of the construction occurred during the winter, which Moss described as "rough." One storm dumped 21 inches of snow in one day on the main Dow Jones campus. Nevertheless, construction finished ahead of schedule, so the project was actually brought online in two phases. About 2.5 MW, or 60 percent of the project, went live in late December 2010. The rest of the project was completed in March. The project was dedicated in June. News Corporation acquired Dow Jones in December 2007, and with the new owner came its Cool Change initiative. The goal is to become carbon neutral, using 2006 emissions as a baseline. Through 2010, Dow Jones already had reduced carbon emissions by 14 percent, and that doesn't include realized benefits from the solar project, Hoffman says. "We did a lot of things long before solar to make our operation more energy efficient," Hoffman says. "It's just the nature of modern business." In fact, the company's commitment to the environment dates back to the 1970s when it started recycling newsprint from printing plants and reducing hazardous waste emissions. During the next 30 years, Dow Jones strived to reduce use of energy and other resources while improving its efficiency, Hoffman says.